Clad in HP's customary black and silver, the £600 HP Pavilion dv6-6b50sa is an affordable, feature-packed media laptop. While it obviously doesn't match up to the premium experience offered by HP's Envy range, it's got plenty to recommend it to anyone who needs to keep their budget in mind. First, and most obviously, it's a great machine to look at. HP consistently turns out attractive computers and this is no exception. Despite only being a 15.6-inch laptop, it's a little bit on the chunky side, but with the chassis dimensions measuring 378 x 247 x 35mm. The entire body is brushed silver aluminium with speaker grills and air vents mixed with jet-black plastic for the keyboard, touchpad and screen bezel. There's no flex on evidence anywhere around the chassis and the tough metal casing seems like it could take a knock or two without any problems. Of course, all that design doesn't do the weight any favours, and the HP Pavilion dv6 is noticeably heavy, at 2.9kg. This isn't exactly a laptop to be carrying around all day. The HP Pavilion dv6-6b50sa will obviously find a lot of favour with audiophiles. Dr Dre's Beats audio technology is being incorporated into all HP laptops, and the extra functionality is welcome. Along with the single speaker strip at the base of the screen, there are two smaller stereo speakers at the front of the palm rest. We didn't have a problem using the dv6 to fill the office with music, although the quality does disintegrate a little when you turn it right up. The comprehensive Beats Audio Control Panel means you can adjust and tune the audio performance of the HP Pavilion dv6-6b50sa to your heart's content. You can shift the emphasis across the speakers for listening or take advantage of features such as noise and echo cancellation for recording. If you have an external microphone, editing software and some sheet music to hand, this laptop is an excellent tool for crafting some of your own tunes. If you're prepared to make the substantial investment in a pair of Beats headphones, then the experience is very impressive indeed and makes a big difference when watching a film, for example. In terms of the screen, the 15.6-inch display on the HP Pavilion dv6-6b50sa is bright and clear, with suitably sharp images. Don't expect to hit Full HD 1080p though, since the pixel resolution precludes this machine playing anything above a 720p high-definition picture. A quick mention must go to the viewing angles and the reassuringly solid hinges on which the screen sits. There's also a relatively thin bezel, which helps improves the viewing experience. For typing, the isolation keyboard works well and gives the chassis a spacious look. The smallish keys respond firmly and accurately and the large backlit touchpad has a thick texture to it. It would have been great to see the keyboard itself backlit, though. Although predominantly a multimedia machine for the home, HP has also included a business-like fingerprint scanner on the right palm rest. This gives you an extra level of security to protect your documents and media. Inside the HP Pavilion dv6-6b50sa is an Intel Core i3 2330M CPU. 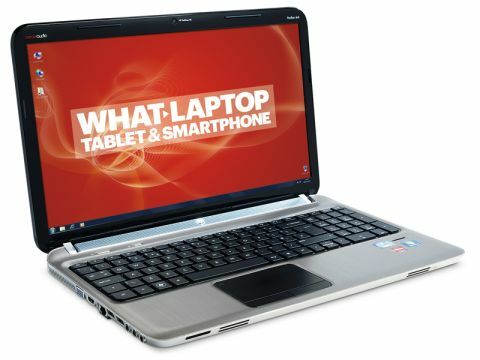 This is the baby of the Sandy Bridge family and part of the reason the price on this laptop is so reasonable. It can't match the Core i5s and Core i7s of this world for power, but that really shouldn't prove too much of a problem for most users. And the main reason we're not too worried about the lesser processor is that HP has compensated with loading more RAM into the Pavilion dv6-6b50sa. While most machines would offer 4GB of RAM, the HP Pavilion dv6-6b50sa has 6GB tucked inside to keep the Windows 7 operating system running quickly. What this means in practice is that you can multi-task comfortably and work with any number of web pages without your browser freezing. Also included in the package is an AMD Radeon HD 6490M dedicated graphics card to take some of the visual strain away from the processor. Although not always as revered as Nvidia GPUs, AMD graphics chips are solid enough. And although you won't be doing any high-intensity gaming on the Pavilion dv6, other graphical demands - such as streaming movies from a service like Netflix - should be no problem. We were also pleased to find that the HP remained not only quiet, but also cool to the touch during periods of intensive use. The connectivity on the HP Pavilion dv6-6b50sa is pretty standard for this price point; there are four USB ports and both VGA and HDMI for external displays. You can use 802.11n Wi-Fi or Ethernet to connect to the web, and there's also a 2-in-1 memory card reader. One last point to raise is that often we find HP machines to be loaded full of the company's own software. Most of the time these are a waste of space. Thankfully, in this case the pre-loaded software is limited to just a few programs. We feel HP has done a good job revamping its laptop range, and the admittedly attractive HP Pavilion dv6-6b50sa offers a good all-round choice for a reasonable price. Although the processor isn't top of the range, the added RAM should give this laptop a decent lifespan and make it a reliable purchase for most users. Anyone who wants a machine predominantly for media or music usage can add an extra star to the score.